It’s like the Australian poetry scene’s twelve-monthly check-up; the so-called “best” of the year’s poems, as chosen from around three thousand submissions, with a little over one hundred making the cut. That’s seven editors by my count. I wonder which one he forgot. Could it be the only woman? How disappointing, that in a decade of publication, there has only been one female editor, and for nine out of ten years, the person deciding the “best” poems written in this country has been male. This is the book I look forward to all year. I enjoy the contents page as much as the poems, scanning names to see who is familiar, and who has broken in for the very first time. In light of the above realization, as a little experiment, I decided to count the male to female ratio of contributors. There were 74 male poets represented and 54 female. It would be interesting to investigate whether women have been similarly subtly outnumbered in the series’ previous volumes, too. Nevertheless, there is a lot to like about this book, with its wide variety of style, subject matter, layout and length, featuring poems ranging from just two lines to eight pages. 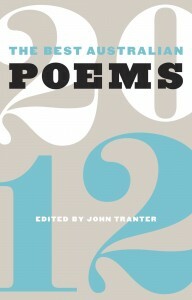 It is clear that, like last year, Tranter hasn’t shied away from including a number of unknown poets beside many established ones, and that’s wonderful to see. I remember my poetry teacher from several years ago, Judith Beveridge, once saying that a poet’s vocabulary is their toolbox; it is their expert command of words that allows them to do their work well. I was reminded of this fact many times while reading this collection, since there were so many words I didn’t know, like ‘lagunaria’, ‘cenotaphic’, ‘Porphyrian’, ‘feuilleton’ and ‘Gurlesque’. At first I started looking them all up, but I soon tired of that discipline since it slowed my progress through the book so dramatically (which wouldn’t normally be a problem, since I like to read poetry at a leisurely pace, but in this instance I had a deadline to meet for this article). I like to think that I’ll return to many of these poems with a dictionary and greater diligence at a later date. Since poetry is language concentrated, this book is incredibly rich. You could unpack many of the poems here several times over. It is the nature of poems that they are written to be reread, and often only reveal subtleties of meaning on subsequent readings. They are also littered with a wealth of inter-textual references, which will direct your reading in many fascinating and unexpected directions beyond the book as well if you take up the invitation on offer. Many of the poems in this collection refer to other poems and poets, as well as historical places and personalities. In fact, one of my favourite poems from this collection wasn’t actually in the book at all, but merely the subject matter of another piece. John Watson’s “A Year before the Accident” was a poem about a poem: Randall Jarrell’s “The Player Piano” to be specific; and I was intrigued enough to seek out that poem online and read it. I was very glad I did. Likewise, Richard King’s tremendously haunting “Three Apples” prompted me to read further on the brilliant and tragic life of British mathematician Alan Turing. There are so many stunning moments scattered throughout this volume that it is impossible to mention, here, all of the poems that meant something to me. Still, I will attempt to give a taste of the treasures this collection has complied for the reader. he had tested the blue and black first). Darby Hudson’s vision of modern society is insightful and unsettling in “Culture”, with its ‘pop songs that have fallen back to earth like false angels; status updates that endlessly stream like mindless SOSs’. And Andy Jackson’s “A Certain Type of Poem” was a definite highlight of the book for me, with so many arresting images, including ‘The immaculate walls of an abattoir’ and ‘A life-support system, humming after the body is taken away’. As I was reading this collection, there were many instances when I felt that cricket ball, hard as hell, hit me square in the chest and leave me breathless. Whoosh. Howzat! You’ve caught me out. Best Australian Poems 2012 is published by Black Inc. Thanks for the mention! So often I never hear anything about my published poems – it’s like it falls into deep water and you have no idea if anyone ever marked its passing. I have a giant grin on my face now. This entry was posted in Arts, Books and tagged anthology, Best Australian Poems 2012, black inc, book review, books, lip verse, literature, poetry, Review, verse. Bookmark the permalink.